Southwest Industries is the pre-vocational and vocational arm of The Arc-South Bay, consisting of two departments: a Work Activity Center/workshop (OES) and Community (Supported) Employment (CES). The WORK ACTIVITY CENTER (WORKSHOP) is designed to provide adults with developmental disabilities the opportunity to earn money, develop work skills, mature socially and prepare for competitive employment. 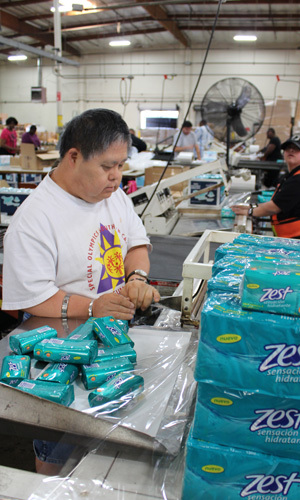 Southwest Industries provides work experience, independent living skills training, basic education and counseling in a habilitation and vocational rehabilitation environment. Clients perform a variety of tasks for wages, based on a piece-rate basis. Businesses click here for more information. Program Participants click here for more information. COMMUNITY/SUPPORTED EMPLOYMENT provides its consumers with a paid work experience in community-based jobs, along with support needed for the consumers to meet their goals, and possibly advance on to individual placements or direct hire positions. Employers/Businesses click here for more information. Program participants click here for more information.